You see it every day; that new report from an agency with a cool sounding word and a couple numbers thrown in there – “The Secret to Social Media ROI.” Now, I’m a big fan of actually tying actions (of any kind) to overall goals – which, in the case of companies that have staff, expenses, etc. usually relate to bringing in cash. However, when we’re talking about social, the idea of bringing a better experience to the customer needs to fit into that equation – Real Online Interactions. What we as a loosely-banded industry are struggling with is the idea that we have to neatly fit into the mold of traditional marketing models of ROI calculations – but it’s harder than that. Now, Jason Falls might call this a tree-hugging hippie way of looking at things (and he’s right), but without a little hippie in the mix, things get might cold and mighty stale really fast. Today’s consumers are much more apt to write about a brand on Twitter, Facebook, a blog, or even a forum than they are to actually take the action of calling customer service/support should have need something or have an issue. More than that, they expect you to respond – 81 percent of them in fact. With all these online opportunities for creating real connections between brands and users, the importance of genuine, open communication becomes paramount. In a day when people know “Frank from @ComcastCares” (Bill Gerth has since taken over) or “Elliott from @AlaskaAir,” there’s a personal nature to these interactions that once used to be thrown up to the Internet gods in hopes that someone, somewhere would see and do something. These interactions became – wait for it – real. 1. Put a face on your brand – It doesn’t have to be the CEO of your company (Frank proved that), but it does have to be someone who has a passion for people and a personable nature that makes them not only effective at their job, but a person that users can see themselves talking with – after all, that’s what they’re doing. 2. Tear down the walls – Users could get the company line from reading a press release, but it’s the fact that they feel like they’re getting a peek behind the curtain that keeps them coming back for more and gives them a sense that you’re on their side (which you should be). 3. Keep it real – Talk to people like they’re people. Don’t use jargon and marketing speak. Some of my favorite accounts on the Web are more interesting because they’re NOT in the normal brand voice, not because they’re mirroring everything about the brand. 4. Don’t be a robot – If I receive a response from a brand that sounds suspiciously canned, I immediately click to their actual Twitter feed to see if they’re just blanket responding to people with “Thanks for the feedback!” or something like that. It takes 15 seconds to craft a meaningful message in 140 characters – take the time. 5. Set aside time – For most small or medium-sized businesses, the time is what becomes the major factor for whether or not social media efforts are able to be personal or not. Setting aside time for these interactions gives people on the brand side a set period where they know they have dedicated time to answering and interacting. 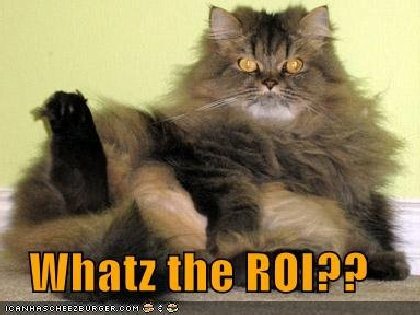 So, when you’re building your ROI model and looking at your overall program goals, don’t forget that “other ROI” and be sure to have a section of your KPIs that focuses on customer satisfaction, sentiment of your brand, and repeat customers/users. While the accounting department is looking at the bottom line and seeing a red or black number at the end of the day, it’s the people who are making decisions about how brands and customers interact with and help each other that are changing the way brands are working in today’s market.